Simpson Spring is proud to introduce our first coffee roast. The Marketplace is proud to carry Blackbird Farm products in our everyday store. The goal at Blackbird Farm is to raise the highest quality meat at their farm in Smithfield RI to supply to the local market. They only raise 100% Angus cattle and 100% Heritage Berkshire pigs and applying meat quality genetics to their herds to produce superior quality meat. Raised with only the best intentions in the most professional way from the farmer and most important the animal. The animals are fed hormone-free, antibiotic-free and non-GMO feed that is ground and mixed on site to be over seen to ensure our animals are only fed the best. The cows are also grass fed and have beautiful pastures they graze on while the pigs have half acre wooded pens where they can naturally root. Blackbird Farm is a family run farm and everyone has an import job to do to keep everything running and together. The farm is what the family loves to do, it's an enjoyment that was able to be turned into a business. The Bouthillette Family loves being able to supply beautiful healthy meat to the local market and knowing that the meat is appreciated and enjoyed for all the hard work put into it. They value and appreciate every customer for supporting their farm! EXTENDED HOURS this Saturday: 5/13/17 10am - 4pm in honor of our first Homesteaders Event. The local man know far and wide for paddling a pumpkin down a river will join the Saturday Marketplace event to talk about letting our kids get dirty and what it takes to grow something. Brown Boar Farm CEO Peter Burrows joins us for our Homesteaders Event. Peter's interest in farming goes back to his childhood in the suburbs of Boston. Growing up, he loved exploring the woods and pastures of his neighborhood, where one of his favorite stops was a local farm. Peter grew to appreciate the importance of preservation, especially in rural towns, after the fields and woods of his hometown were lost forever to suburban sprawl. Peter and his wife Regina passed on their love of the outdoors and gardening to their children, Meaghan, Sarah and Christopher, who enjoyed working in the family vegetable garden and taking care of their pet chickens. After Regina passed away in 2001, Peter and Christopher decided to combine their common interests in the outdoors and the environment and purchased the land in East Wells that is now the home of Brown Boar Farm. Soule Homestead Education Center is a non-profit education center in Middleboro, MA providing environmental programs, craft workshops and cultural events. Megan Riley will be joining us on Saturday to talk all things Chicken related. Kids love local Magician and Balloon Sculptor The Great Rolando! He'll be with us on Saturday for an hour or so of pure, innocent fun! Local 4H members and homesteaders will have many of their fuzzy friends here at Simpson Spring. Fun for kids of all ages (and adults too!)! Some of the best tasting Kettle Corn North of The Mason Dixie Line. Their ovens are custom-built from bricks, concrete, and stainless steel. Fiamma Bella produces food of the highest quality, made from local, seasonal, superb ingredients. Instead of offering a lot of mediocre choices, Fiamma Bella has an intentionally small, thoughtful menu of sweet and savory foods that our chef/owner, Melanie Ciccarelli, continues to perfect. They are a mobile wood fired catering company and will be making made to order pizza all day! Cupcakes: Carrot Cake, Strawberry w/ white Chocolate, Hostess w/mostess, Mocha Maddness, Oreo, Peanut Butter Cup, Double Chocolate, Madagascar vanilla. Cookies: chocolate chip, oatmeal, brownies, carmelitas, anisette, & peanut butter. Why should I use essential oils in a diffuser instead of room deodorizing sprays? Peppermint - helps increase energy and mental alertness. Eucalyptus - helps combat respiratory diseases, and enhances concentration. Lavender - helps relieve stress, and combat colds, flu, and migraines. Tea Tree Oil - boosts immune system to help fight infection. Rosemary - has antidepressant properties, also a mental stimulant ideal for enhanced memory, focus and overall brain performance. Patchouli - helps to relieve anxiety, depression, fatigue, and curb addiction. In addition to our regular Marketplace Event, we will be hosting our annual Marketplace Egg Hunt! Bring the kids! This year our egg hunt will take place in the fields behind Simpson Spring, which can be a little muddy. We recommend waterproof shoes or boots! The Easter Bunny is here - bring your cameras! Kids can enjoy playing with the Wild Wood Creations puppet theater . Meet and greet with the local creators of some of your favorite Marketplace products including FitNuts, Sacred Cow Granola and To Die for Dips! Plus we are stocked with Simpson Spring Water, Old Fashioned Soda, Craft Seltzers and your favorite organic and sustainable sourced meats, Sophia's Greek Yogurt, artisan baked goods, healthful snack items and so much more! When March comes around our Lemon-Lime Flavored Old Fashioned Soda becomes very popular. So here are a few cocktail and mocktail ideas that will make your "Irish" eyes smile. Mix all ingredients together. Add ice. Serve. Garnish with mint and more lime. Our classic take on a classic. 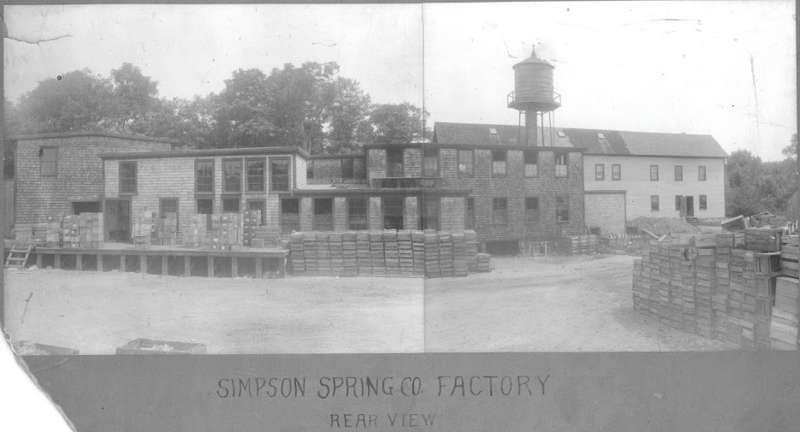 While the Simpson Spring we know today is a thriving bottler of the highest quality pure spring water, and old-fashioned craft soda, and the incubator of local food producers and entrepreneurs across New England, the building itself has been in operation since 1878. Travel back in time in the oldest bottling plant in the country! See remnants and artifacts from the factory's salad days in the 1930's and 40's when they were distributors of the beloved Moxie soda and experience the part they played in the early days of the soft-drink revolution. Hear stories about R.H. Macy and their influence on Coffee Soda and learn real story behind a brief stint they had with a well-known cola company. The spring itself dates back to 6000BC. While you are on a tour of their historic building, you will actually get to see the spring where all of their water comes from - You'd be hard-pressed to find another water company that would be able to finagle a thing like that! Tour participants will also spend time in the Simpson Spring laboratory where the historic flavors you enjoy today were first created. Free tours of the Simpson Spring historic museum happen every Saturday at 11:00am and 1:00pm or any time by appointment, call 508-238-4472 to schedule. What is the difference between essential oils and fragrance oils? Many people confuse the terms "essential oil" and "fragrance oil" because of the frequent incorrect practice of using these terms interchangeably. However, essential oils and fragrance oils are different in a number of ways, mainly due to the way they are created. Most pure essential oils are extracted from plants through steam distillation. Freshly picked plants are suspended over boiling water, and the steam pulls the oils out of the plant. Many essential oils, such as lavender and eucalyptus, are used for their therapeutic benefits as well as their pleasant aroma. Fragrance oils are synthetic products and therefore do not possess the natural healing properties of essential oils. Fragrance oils are essentially just a "pleasant aroma" created in a lab using various chemical combinations. Fragrance oils may contain a certain percentage of essential oils, but they are not completely natural, like essential oils. When making my Piper Dee Naturals products, I only use therapeutic-grade essential oils and never fragrance oils. You can find my products at the Simpson Spring Marketplace six days a week, or online at www.PiperDeeNaturals.com. Got a question? Email me at PiperDeeNaturals@gmail.com. Keep Easton Beautiful, in conjunction with The Easton Shovel Town Cultural District, is thrilled to announce The Beautify the Barrel Campaign. As part of Keep Easton Beautiful ‘s Second Annual Spring Clean Up, the two groups are sponsoring a trash barrel painting/decorating contest for local artists with first ($250), second ($100) and third ($50) prizes, as well as a People’s Choice Award. Keep Easton Beautiful Co-Founder Kristen Stone said, “We are very excited to be partnering with the Cultural District and local artists. It is our goal to raise awareness of the litter problem in Easton in a positive way. Beautify the Barrel is one aspect of that effort.” Artists will be given freedom to create within guidelines designed to promote keeping our environment clean and beautiful. After the contest, the barrels will be strategically placed around Easton to encourage residents to dispose of their trash in a responsible manner. “Art can be a constructive influence in our community and on our culture. Beautify the Barrel is a fine example of that influence and The Cultural District is pleased to be a part of that.” said Carolyn Cole, Project Advisor and Artist Liaison, Chair of the Easton Shovel Town Cultural District. In keeping with its commitment to serve the community through local projects, activities and events, Easton Grange 196 has generously provided barrels for the contest. The groups are also pleased to announce that the barrels will be judged by prize-winning local photographer, Rich Hudson, award winning artist, art juror and co-owner of Turning Point Design, Allison Krajcik, as well as, Chair of Easton Shovel Town Cultural District, Carolyn Cole. Pour Simpson Spring Root Beer into a small saucepan and simmer until it has thickened and reduced to approximately 1 cup. This may take up to an hour. Season the salmon with salt, pepper and crushed garlic. Heat a skillet over medium high heat. When it is good and hot, add the olive oil. Add the salmon, skin side up and sear it for 4 to 5 minutes, depending on the thickness of your filet. You are looking to brown the fish and to see the sides of the filet starting to cook. When this happens, flip the salmon over and cook for another 4-5 minutes or until desired doneness. You’ll know it is ready when the fish flakes easily with a fork. Remove the fish to a plate and spoon the Root Beer glaze over the top before serving. Garnish with an orange or lemon slice and some fresh dill for a beautiful presentation. This salmon pairs great with your favor couscous side and some steamed greens. We love it with broccoli or in the spring when the asparagus we grow out back is ready for picking! What is deal with Tea Tree Oil? What are some uses for Tea Tree Oil? Add a few drops to your laundry detergent when washing cloth diapers or especially stinky athletic clothes. It will kill the bacteria and make everything smell clean again! Add a few drops to your child's shampoo. Tea Tree Oil naturally repels lice! Add a few drops to 1/4 cup olive oil and use it as a spot treatment for acne. It will kill bacteria trapped in the pores and help clear up those blemishes. Make a deodorizing spray with witch hazel, water, and Tea Tree Oil for use on hockey and football equipment. Any hockey/football parent knows how gross all of that gear can get. Keep it from smelling like a locker room with Tea Tree Oil! You can add Eucalyptus and Peppermint as well for added benefits and a better scent.